Notes say this projector is at the Liberty Theater 308 Oak Street. It looks like they have an elaborate mechanism for synchronizing audio with the movie. But you can imagine over a 90 minute feature even a slight difference in speed between the turntable and the projector could be very annoying. This is a great example of electro-mechanical technology that brought "talkies" to life! Beautiful!! I'm wondering if the large wheel on the lower right might be a way to manually adjust the record speed so that an alert operator can maintain audio/video synchronization. This problem still occurs today with digital TV occasionally losing "lip sync". Very annoying. Neat picture. 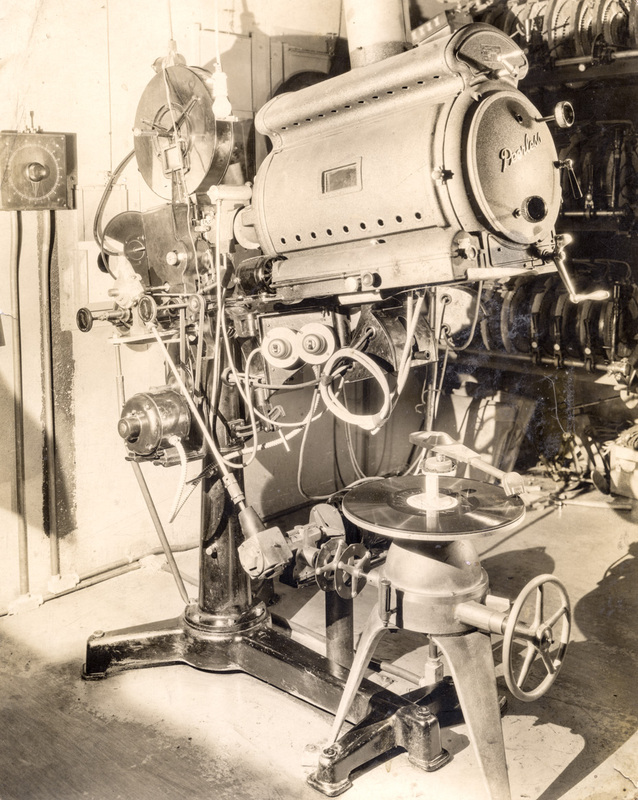 Projectionists earned their money back in the day. Now if the movie industry could just figure out how to make a movie worth watching. Amazing. So much to unpack in this image... like a giant Rube Goldberg machine. I especially appreciate how the photographer pointed his camera eye toward something far from the limelight, but nevertheless a historic photograph with vibrant vital signs. brings to mind that father John L had a part time job, probably in the late 1940s, counting people attending movies at the Railto....I think he was working for the movie distributor....maybe the theater paid the distributor based on ticket sales and his counts were a double check...not sure of this. Either Roger or I have his counters. About 1930 my dad was a projectionist and my mother an organist for silent films. I'm glad to see I'm not the only one to enjoy this image. Synchronizing audio and video has been a difficult engineering problem for decades. I spent many years working on it. Nature still hasn't worked it out-- consider thunderstorms!